I’d love to tell you we’re starting a new build project today or I had a new tool or two to share (which I do, but that’s for another day) but instead this is just a quick “heads up” of what’s happening and NOT happening with the show. Unfortunately the warm days of early summer draw me out of the basement and in to the fresh air and sunlight. But luckily for the show, coming in the next several weeks, that same fresh air and sunlight will be SO HOT I’ll be retreating to the basement to enjoy the rest of my summer months. So new content is just around the corner, I swear! Off on a tangent…in honor of Father’s Day 2012 I have a couple of great titles written by Jack McKee of www.woodshop4kids.com. 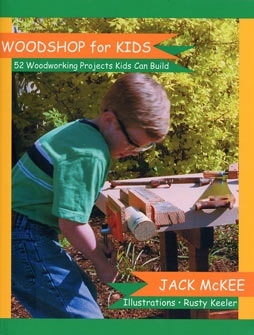 “Woodshop for Kids” & “Builder Boards” are two books filled with great ideas and projects to help you introduce your kids, grandkids, nieces or nephews…whoever they are…to woodworking. Because Father’s Day is next weekend (as I’m posting this) I’m offering copies of these books to one winner next Sunday. How do you get entered? Either email me a picture of the project you built with your young woodworker, or a description of it, or even leave a comment about it in today’s shownotes at the website. A few months ago my son, who is in middle school, asked me to help him build a project for science class. he needed to build a model of a plant cell. You could build the model out of anything you wanted and the materials list suggested styrofoam balls, pipe cleaner, etc. The usual suspects. Being a woodworker, I figured the best material would be of course .. wood. So we got to work and built a base (chloroplast) out of plywood and we turned all sorts of funky wooden shapes to represent the nucleus, ribosomes, mitochondria etc. out of maple, mahogany, cedar and a bunch of other scraps I could find. I had my son drill holes in each cell structure and into the base and propped each structure up on a bamboo skewer. He then made labels for each structure and glued it to a toothpick and inserted the toothpick into a small hole drilled into the respective cell part. He got a great mark on the project and the teacher asked if she could keep it as an example for future years. Plus we had a great time building together. I’ll have to take pictures and email them, but I try to take my daughter (turned 4 today) to the kids build projects at Lowe’s. Out latest was the monkey plane fromMadagascar 3 which we built yesterday afternoon.